Mobile-friendly version is available here. For android devices a stand-alone application is available on Google Play. For iOs devices (iPhones and iPads) to make the mobile page available offline, click on this "magic" link and bookmark the opened page (you can then open this bookmark without internet connection). Calculated values are exact when the cold junction is at 0 °C. Temperature correction is valid for cold junction temperature not higher than 250 °C. B-type thermocouple works only above about 90 °C, but is almost unsensitive to the cold junction temperature. Hess N.J. and Schiferl D., J. Appl. Phys. 71, 2082 (1992). Note: this calibration is valid without temperature correction at least up to 800 K.
Akahama Y. and Kawamura H., J. Appl. Phys. 100, 043516 (2006). Note: Raman signal should be measured at the center of culet. This scale is not valid to estimate pressure gradients. Temperature correction is not known. 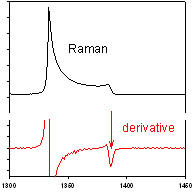 The "measured position" is the minimum of the Raman signal derivative (see image below). Dubrovinskaia N. et al., Appl. Phys. Lett. 97, 251903 (2010). 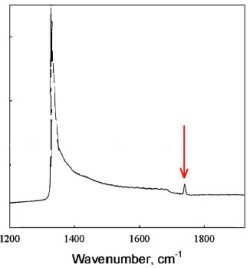 Note: It is not a Raman signal from an anvil, it is a peak from diamond inside the sample chamber.